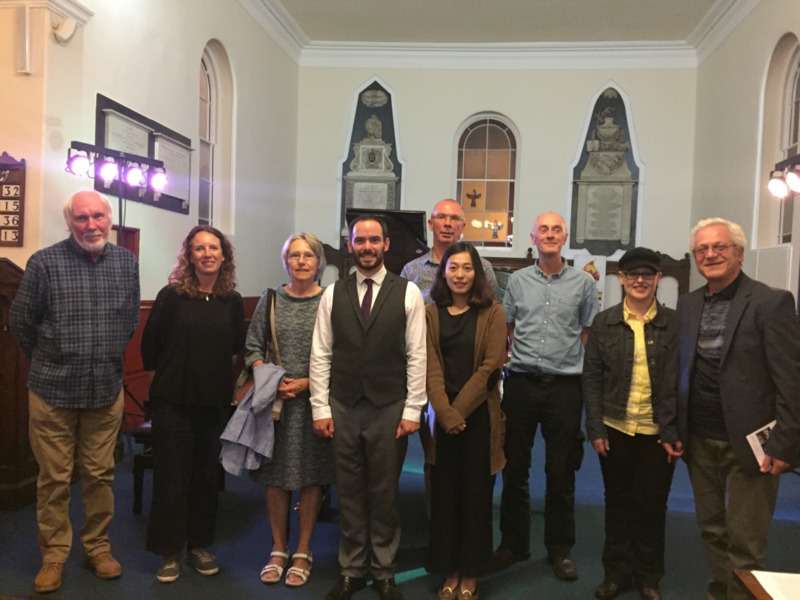 The British pianist lit up York Unitarian Chapel, much to the delight of the expectant crowd. With the main square of York ticking over as the day became night, York Unitarian Chapel sat on a beautifully quiet road, just a stone’s throw away from the hustle and bustle. A generous mix of composers, pianists, and young students alike filled the chapel. James Willshire arrived to an anticipating round of applause, and took his seat at his Yamaha Grand. An absolutely fascinating performance ensued. The composers' contemporary approaches to their selected Debussy pieces were a breath of fresh air, and a real source of inspiration for any young composer or pianist out there. Piece number one was composed by David Lancaster, and uses Debussy’s The Snow is Dancing as its inspiration. He calls his work, Snow/Dance. The process of transformation in this piece, from original Debussy to the composer’s own soundworld, is a gradual one. Debussy remains always in the foreground, albeit with some unusual harmonic shifts. A technically demanding yet elegant piece that Willshire glided through with ease. The choice of this relatively obscure and modest Debussy piece is one that paid off for composer Holloway. His own soundworld is reached by finding completely different routes to Debussy’s original climax of the piece, before winding down to the same common opening. We are treated to some humorous playing at times as the hands chase each other up and down the piano! The piece is constantly re-interpreted. Using Debussy’s Et la lune descend sur le temple qui fut as her basis, Jia Chai concerned herself with creating a soundworld that uses music materials that are derived directly from the main music materials that Debussy used. Chai’s composition depicts the image stated in this original piece’s title. Featuring generous amounts of space in the middle register, along with some beautiful cluster chords, James Willshire paired this fascinatingly beautiful piece with an equally beautiful performance. Composed in one of the most northernly points of the Scottish Highlands, Wallen definitely took her re-imagination of First Arabesque up in a northernly fashion. The original piece becomes unrecognisable as Wallen takes us into Another Arabesque, before return to the original before the piece’s end. Despite really ‘taking it north’, the piece holds on firmly to those famous First Arabesque arpeggios that so beautifully dominate the piece. Whilst the majority of the other compositions took Debussy forward, this piece appeared to move sideways into the world of Erik Satie. Its originality was a breath of fresh air, and Willshire took it on with confidence. This piece is based on De pas sur la neige, which Willshire opened the concert with. We were able to witness and hear clearly the two contrasting pieces; Debussy’s original, and Plowman’s fantastic version. Simaku chose to utilise one of Debussy’s less well-known pieces; the first of a set of three piano pieces called Images (oubliées), which was not published until well after Debussy’s death. Littered with arpeggios, this compositional journey brings the ‘imagery’ of the piece to the doorstep of our time. Willshire beautifully portrays the glorious combination of sparse yet overflowing use of said arpeggios. Using The Little Shepherd from ‘Children’s Corner’, LeFanu and Willshire made it easy for me to review this particular piece; it was delicate and fitting. Based on Les soirs illumines par l’ardeur du charbon, which is considered Debussy’s final piece of piano music, this composition is inspired additionally by the composer’s own love and respect for many art forms besides music. Willshire manages to bring Debussy’s colour and Ríain’s love of art into this interpretation. It humorously made for a very Debussy-esque piece! What a fantastic way to end the 10 New Debussys! Parkin includes some manic playing in his piece at times, however you cannot take your eyes – or ears - off the chaos. The few silent bars that feature completely pull you in. There was such a variety of technique on display throughout this piece. It looks extremely very fun to play!